Terra Branford is just one of many protagonists according to the Final Fantasy VI developers, but inofficially she was always seen as the main character. 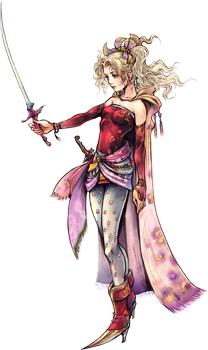 In Final Fantasy Dissidia for the PSP, Terra was chosen as the Warrior of Light representing FFVI and met her arch enemy Kefka again. Terra was one of the most popular FF characters chosen for the first round of our Final Fantasy Art Collaboration and i am glad that we got three very different illustrations to tribute her! Why did you choose Terra? 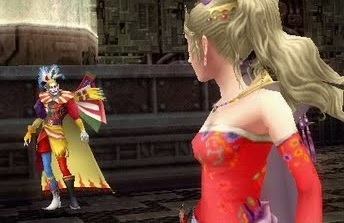 Terra is an amazing character to me. I am fascinated with how she is such a strong and frail character at the same time. I think all her dualities and the hardships she goes through the game stuck with me and trying to portray all this with one image is certainly a very hard task. FFVI is a very beautiful game. It has a very dark mood, different from the previous titles on the series, and the way that it tells the story, by making you see the different viewpoints is something unique and, even today, rare to see in a game. 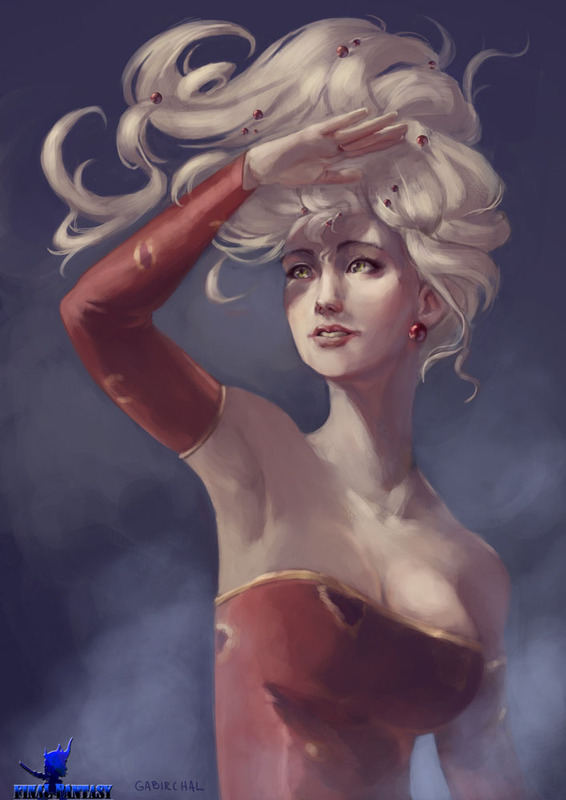 Also FFVI stands among one of the best RPGs I’ve ever played so I felt compelled to pay a tribute to them. What toold did you use for the artwork? The whole artwork was done digitally using a wacom intuos tablet and Photoshop. I used photo reference for some details like the hand and the face. It’s been a pleasure to participate in some art projects for Game Art HQ. I hope you guys enjoy it as well and I look forwatrd to see many, many nice art projects come form this. Gabriela Birchal is a professional artist from Brazil, and liked the idea of Link’s Blacklist in which she participated multiple times now before her take on Terra for this Final Fantasy Project.She is on board in round 2 as well and claimed Rydia from Final Fantasy IV for it! I used this particular piece as an opportunity to try my hand at a cel shaded look which I haven’t had much practice with in quite some time. I sketched and inked it in Manga Studio 5 and then imported it to Photoshop where I finished coloring. 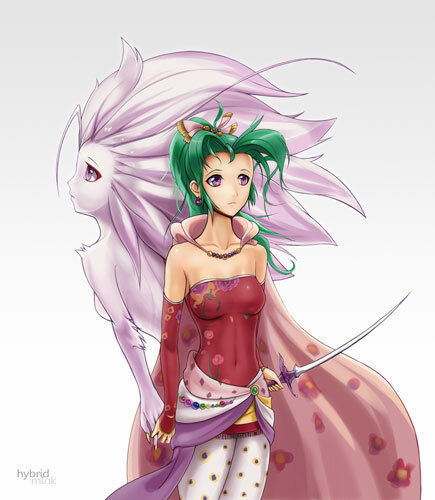 When doing fan art of Final Fantasy characters, I tend to lean more towards the original vision by Yoshitaka Amano. Though Terra has green hair in many renditions, Amano seemed to always make her blonde. So here I tried to combine both a bit. 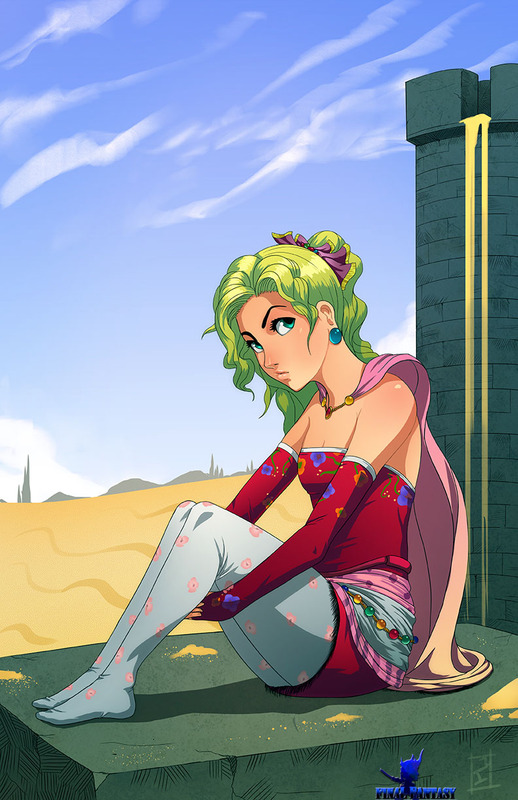 The reason I love Final Fantasy VI was because of all the great characters. It’s debatable as to who the main protagonist was, or if there even is one. However, if one character had to be chosen as the primary character I’m sure many would agree that Terra seems to fit the bill. We are introduced to her right off the bat and her background story seems to tie in closest with the game’s theme of magic vs. technology. ISquaredArt is an artist from California and draws all kinds of stuff including comics too. his is the first time he participated in a Game-Art-HQ Art Collaboration! Terra is my favorite female protagonist from one of my favorite FF games. Her development as a character and the struggles she overcomes really make her likable. FFVI overall has a great cast of characters and I really like the world and story, as well as the individual skills each character has. I like how VI doesn’t really revolve around just one character so the story is always interesting. It also has the most evil villain of all time. I used Corel Painter and Photoshop on this piece. I wanted a pose and expression that conveyed her role as a human and an esper. Nick “Hybridmink” Sabrino is a professional American artist and on board at Game-Art-HQ since October 2011 already when he participated in one of our first projects with Mu from BlazBlue for the Boss Tribute. He continued to join other projects like our Street Fighter and MegaMan Anniversary Tributes among others! Beside the only FFVI characters drawn so far are Sabin and Celes, click on the logo below to return to the main gallery of our new project!